A method to facilitate regioselective formation of multiple dicarba isosteres of cystine is described. A sequence of ruthenium-catalyzed cross metathesis and rhodium-catalyzed hydrogenation of non-proteinaceous allylglycine derivatives has been developed to achieve high-yielding and unambiguous formation of diaminosuberic acid derivatives. Allylglycine derivatives readily undergo ruthenium-catalyzed metathesis and hydrogenation to yield diaminosuberic acid derivatives in near quantitative yield. Under the same experimental conditions, prenylglycine was found to be inert to both Grubbs’ and Wilkinson’s catalyzed metathesis and hydrogenation, respectively, but was readily activated for metathesis via cross metathesis with Z-butene. Subsequent cross metathesis of the metathesis-formed crotylglycine derivative, followed by hydrogenation, yielded the second diaminosuberic acid derivative in excellent yield. Citation J. Elaridi, J. Patel, W. R. Jackson, and A. J. Robinson, J. Org. Chem., 2006, 71, 7538-7545. Homogenous Grubbs-type pre-catalysts have played an important role in the application of olefin metathesis to organic synthesis. Grafting of these homogeneous catalysts onto solid supports can aid catalyst recycling and removal of metallic residues from the product stream by filtration. In this paper we describe the reversible immobilization of a quaternary ammonium Hoveyda-Grubbs olefin metathesis pre-catalyst on sulphonic acid-functionalised silica-coated iron oxide magnetic particles. 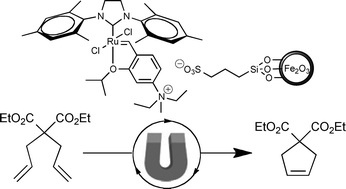 Following ring closing metathesis, the catalyst can be removed from the reaction via a magnet for reuse and/or regeneration. Citation M. J. Byrnes, A. M. Hilton, C. P. Woodward, W. R. Jackson, A. J. Robinson, Green Chem., 2012, 14, 81–84. Acyclic diamines are valuable feedstocks for polyamide synthesis. Ruthenium-alkylidene catalysed cross metathesis of amino alkenes is problematic and acyl derivatisation can result in less efficient syntheses, poor catalyst turnover and isomerisation. Temporary amine masking via stable and soluble ammonium salts delivers cyclic and acyclic aminoalkenes in high yield and purity. C. P. Woodward, N. D. Spiccia, W. R. Jackson, A. J. Robinson, Chem. Commun., 2011, 47, 779–781. Temperature-sensitive fibres and textiles can be applied to a variety of medical and engineering thermal mapping applications. A three-layered composite fibre has been generated via a modified wire-coating melt co-extrusion process. The continuous fibre consists of a thermochromic liquid crystalline (TLC) layer encapsulated between a transparent polypropylene outer sheath and a black poly-ether ether ketone inner core. The fibres exhibit clear thermochromic behaviour consistent with the behaviour of unincorporated TLCs, and have been formed into a textile. Citation L. van der Werff, I. L. Kyratzis, A. Robinson, R. Cranston, G. Peeters, M. O’Shea, L. Nichols, J. Mater. Sci., 2013, 48, 5005–5011. not been elucidated to date. In this paper we describe the regioselective synthesis of dicarba analogues of Vc1.1 using olefin metathesis. The ability of these peptides to inhibit acetylcholine-evoked current at rat α9α10 and α3α4 nicotinic acetylcholine receptors (nAChR) expressed in Xenopus oocytes has been assessed in addition to their ability to inhibit high voltage-activated (HVA) calcium channel current in isolated rat DRG neurons. Their solution structures were determined by NMR spectroscopy. Significantly, we have found that regioselective replacement of the native cystine framework with a dicarba bridge can be used to selectively tune the cyclic peptide’s innate biological activity for one receptor over another. The 2,8-dicarba Vc1.1 isomer retains activity at γ-aminobutyric acid (GABAB) G protein-coupled receptors, whereas the isomeric 3,16-dicarba Vc1.1 peptide retains activity at the α9α10 nAChR subtype. These singularly acting analogues will enable the elucidation of the biological target responsible for the peptide’s potent analgesic activity. Citation B. J. van Lierop, S. D. Robinson, S. N. Kompella, A. Belgi, J. R. McArthur, A. Hung, C. A. MacRaild, D. J. Adams, R. S. Norton, A. J. Robinson, ACS Chem. Biol., 2013, 8, 1815-1821. We have recently described synthetic routes to the azaspirocyclic ring systems found in marine tricyclic alkaloids such as Cylindricine A utilising a Ru-alkylidene cross-metathesis reaction and acid-catalysed cyclisation. Construction of the third ring, however, requires cross coupling of a highly hindered, α-substituted methylenecycloalkane. CM of such olefins is highly challenging. This paper describes a generic steric-reversal strategy that can be used to react previously unreactive, sterically demanding alkenes using commercially available catalyst. Citation J. Wang, W. R. Jackson, A. J. Robinson, Organic Letters, 2013, 15(12), 3006-3009.